The Hearing Body: How auditory perception influences body representation is a project led by Dr Ana Tajadura-Jimenez at the Interactive Centre at UCL. Read input position of a finger, and it’s applied pressure when the finger is touching the surface of a tablet (A Wacom Intuos Pro or a Synaptics ForcePad). Calculate the velocity of the fingers motion. Dynamically map the provided audio samples of the different textures being touched with different force and speed to respond accordingly. Have the option to turn-off pressure and/or velocity response. 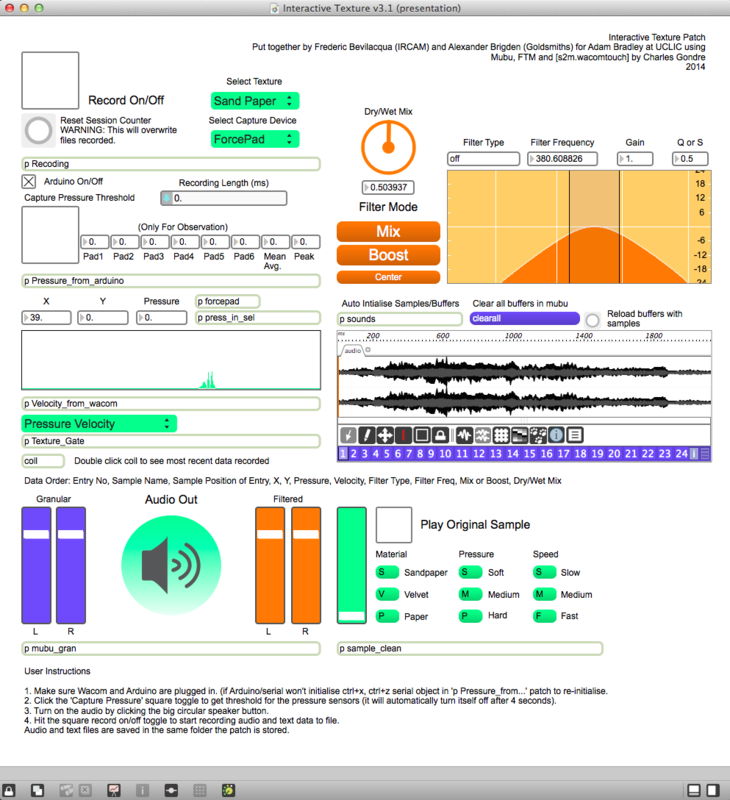 Add a an audio filter (highpass, lowpass, bandpass etc). Record the output sound to file. Record all data parameters relative to the audio recordings position for: X and Y position of finger, velocity, pressure, filter type, filter value, and sample currently read. As the Wacom uses a digital pen to capture the drawings tablet pressure (and the experiment requires the use of a finger) piezos were fitted to the underside of the tablet and plugged into an Arduino to gain a useable pressure value. After a Week I had the patch working correctly; mapping different velocity and pressure input to their corresponding samples within the choice of texture (sandpaper, velvet or paper), as well as accurate data capture and the additional requirements of the patch. The following day tests were made with the use of a ForcePad by Synaptics, however as the device is Windows based it required the data from the device to be sent via network which resulted in lag (meaning the sound did not accurate match the gesture captured). Ultimately this led to the decision to continue using the Wacom, and the patch built. Image of the patch built. Having previously only coded with an artist output in mind, it was very interesting to work with a different criteria and conditions to adhere to. Consequently the experience was highly enjoyable, and I hope to be involved in further projects of this nature in the future. This entry was posted in Uncategorized and tagged coding, gesture, interaction, max, max/msp. Bookmark the permalink.